It is very nice to hear a Lee Hazelwood production that doesn't sound like Lee Hazelwood. Not that I don't like Hazelwood. I love him, which is why it is good to hear him outside of the smokey pop sound he is known for. 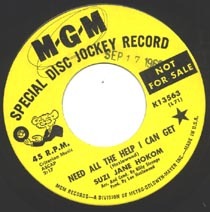 Suzi Jane Hokom - rumored to be his girlfriend at the time, with what I would guess is a put-on name - fronts one garage rocker and one pop number with the classic Hazelwood sound. The rocker, "Need All The Help I Can Get," has a little bit of Duane Eddy production style and a little bit of "Boots", and a really nice swing. "Home," the flip, clearly shows how lucky Nancy Sinatra was that Lee had another lady singer to work out his ideas with. Suzi Jane is a good singer and "Home" is a fine song, but Nancy handles Hazelwood's songs and production much, much better. Nice to have you back, Scott. Impressive piece of Nancy Sinatra history you've unearthed here. Yup, Nancy and Suzy Hokum are one and the same (the last name is the giveaway). Hire any detective you want, but you won't find a shred of evidence that someone named Suzy Hokum actually existed, tho some folks are still being rather coy about this for some reason. Nancy used it when she went beyond her Reprise contract. And I do think these tunes sound like her from what I can hear - the vox on "Need All The Help I Can Get" (good tune, btw) are a bit obscured by all the overdubbing. in any case, the "Suzy Jane Hokum" on Mort Garson's “The Wozard Of Id” certainly sounds like our Nancy. Excellent, BOTH sides here. Thanx!!! Hokom worked as a receptionist for him. also both Hazelwood & Nancy insist they never dated. I've got a copy of Hazelwood's unpublished autobiography in which he mentions no romance with Nancy. no, I'm not totally certain that Nancy is Hokum. It's circumstantial evidence, but: Hokum is almost certainly a stage name, there's really no evidence of her existence, the sole picture of her looks like Nancy...I'll tell you what - Nancy appears at events around here in LA sometimes, so I'll make the effort to ask her in person. The truth is out there! I agree that the name must be a fake - it sounds like a Hazelwood joke. I read that Hokom worked for Hazelwood as a secretary and he had her do backups on a few records and then tried to make her a star. But that too could be Hazelwood myth-making.